Time to break some codes! No not really. This anime is not about code breaking or anything related to that, but rather, it is about an intense battle between good and evil. Riding the bus one day, Sakurakouji Sakura looks out the window to see people being burned alive with a blue fire and a boy her age who's unharmed and standing over the people. She comes back to the site the next day and there are no corpses or evidence of any kind of murder, just a small fire. She then goes to class to find there's a new transfer student, Oogami Rei, who looks exactly like the boy she saw before and wears a black glove only on his left hand. Oogami is a Code Breaker, one who "does not exist". He is a seemingly cold-blooded killer who follows the principle of "an eye for an eye", to "use evil against evil". Convinced that killing is not right, Sakurakouji sets out to stop him and penetrate his icy heart. Code:Breaker seems like any other shounen anime that features lots of battles and epic moments. Somewhat that is true. You may find the generalism in story and characters a bit boring or too mainstream, but I felt I kind of needed this type of anime once in a while. The story isn't too bad, but as said before, it is quite predictable and generic. It is pretty much a stereotypical shounen anime where the main character is all powerful and lets nothing get in his way. And then of course you got this all caring girl that tries to help the main character is whatever way possible. She somehow ends up in trouble then gets saved by the main character. They then share the same secret and fight off the bad guys along with a few other allies. That pretty much sums up the story of Code:Breaker in a nutshell. Oh, and don't forget the final boss battle that always happens at the end of these anime. It is pretty much standard stuff and not that ground breaking. The art was quite well designed and illustrated. The animation was flawless and smoothly transitioned. The various special effects were quite spectacular. The characters also looked great and appealing. Overall, there were no problems here. The voice acting was solid here and each character felt unique and alive in their own respective way. The opening and ending songs were also quite good and appropriate to the anime. As for characters, you have a huge range of different types of personalities to choose from. Oogami Rei is the more mysterious, cool, and "don't care about anything" type attitude. However, on the inside, he is actually thoughtful and kind; he just doesn't show it to anyone. Sakurakouji Sakura is quite the nosy person. She gets slightly annoying but in the end, she is just another character to keep the story going. She is also quite caring but wants to stop Oogami from killing people. The anime also features a few other characters from your evil mastermind (Code:01), mysterious weirdo (Code:02), cool dude (Code:03), random cat person (Code:04), and a tough chick (Code:05). You definitely won't get bored with this bunch. Overall, I enjoyed the anime pretty much. I wasn't that all annoyed at the generic storyline or predictable storyline. Sometimes, such anime can be good once in a while. I do miss a bit of cliche lines and pointless battles. 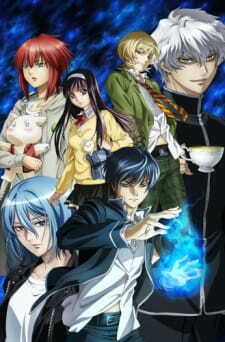 Code:Breaker is one of those anime you will thoroughly enjoy watching once and not pick it up again.